This may not be funny to ANYONE out there but I have to post it. 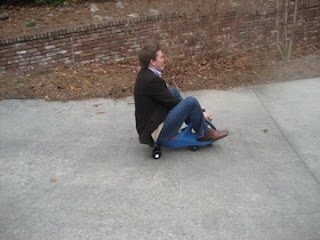 The kids got those plasma cars for Christmas. They're just funky riding toys for outside! Well, we sent them outside to play with their new toys and found this instead! The poor kids couldn't even enjoy them - the grown men got a hold of them! Believe me, Robert had the other on in no time. This is my crazy brother-in-law Mac! It gets better. He had the brilliant idea to take it to the giant hill on the ROAD!! Now let me set this up. Mac didn't think TWICE about the fact that no one was stopping traffic, or if the plasma car was even capable of such speeds! We started DYING laughing (that's why we can hardly talk). When he crosses the 4 way intersection (with no cars coming thank GOD) he lets out a "WOOHOO!" 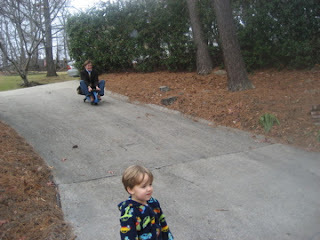 Then, he's still going SO FAST he turns around in the circle and comes halfway back up the hill!! 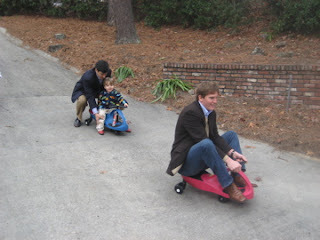 It wasn't long after that that we see Robert and Mac (coat tails flying) were racing down the hill together! ON THE CHILDREN'S TOYS!! We know what to get them next year!